She discovers the security leak is more than a case of commercial espionage: someone is lying in the shadows, playing games with them. Now more than her heart and career are at stake–her life is on the line. 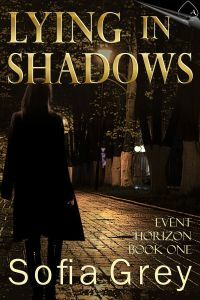 Lying in Shadows is the first in the Event Horizon series of contemp romantic suspense stories. Some of the characters may already be familiar to readers from the Talisman series, and the standalones Perfect Stranger and Pole Position. Time-wise, this is set just after Pole Position, and a couple of years before the Talisman series starts. P.S. – Event Horizon are a rock band. This could be a whole new genre – hot rocker romantic suspense? ← OMG – 1 week to release day!